On July 2nd, a roundtable meeting “Strategy for the energy crisis communication” was held at the office of Hennadii Udovenko of the Diplomatic Academy of Ukraine. 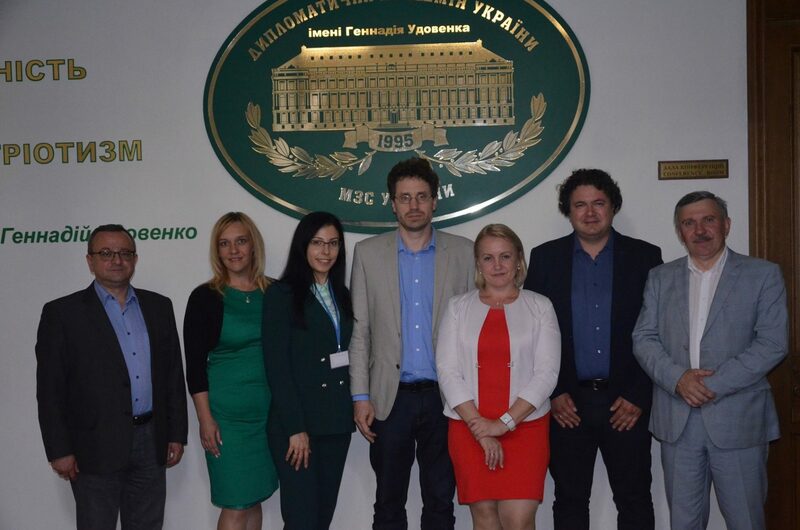 It was the third workshop of the “Energy security and effective strategic communication the civil and governmental actors: V4+Ukraine” project, sponsored by the International Visegrad Fund. During the event experts from Casimir Pulaski Foundation presented a report entitled “Making crisis simulation matter”. Furthermore, participants from Hungary and Ukraine laid out the framework of communication during emergency crises in their respective countries, as well as the platform for communication among experts in an event of energy crisis and issues of information policy were all discussed on the meeting. Dr. Sergiy Korsunsky, Ambassador, Director of Hennadii Udovenko Diplomatic Academy of Ukraine delivered the introductory remarks. Dr. Korsunsky noted that “V4 countries and Ukraine share common interests in the field of security of natural gas supply and transit of Russian gas to European consumers. Therefore, it is important to develop strategic communication between above-mentioned states, to strengthen the trust between actors and improve coordination and planning of their energy policies, including in the field of crisis management”. Dr. Natalia Slobodian, research leader of the project team, delivered a presentation on the future simulation workshop, its goals, scenario and layout. Arguing for the role of simulations in strengthening the energy security she stated the following “Let’s look at the military sector. They regularly have so-called command and staff exercises or games, where military threats and emergencies are modulated alongside all the potential scenarios how to solve or mitigate these problems. It’s worth noting, that while energy issues are a part of many crisis simulations the energy crises in their own right are very seldom a focus of attention. Nowadays the situation in the energy sector has dramatically changed, when one of the key energy suppliers declared that energy can be used as a weapon and a tool for coercion, meant to achievet certain foreign policy goals. We don’t know when, where, or how big the energy crisis will be, but we should be ready to react quickly and to look for the best solutions for our countries and the entire region. Actually, the simulation game is a perfect instrument for governments and decision-makers to evaluate the situation, modulate the crisis and finally, to find the best solution. We should clearly understand that the goal of any simulation is not to win but rather to use it as an opportunity to evaluate the decision making processes in certain circumstances”. Michaela Karaskova, the President of KNO Czeska, emphasized that military sector regularly organizes a so-called command and staff exercises or games, where military threats and emergencies are modulated as well as the all potential scenarios how to solve or mitigate the problems are in the focus of these games. It’s worth to note that in recent times the issues related to energy security are a part of many crisis simulations but I should stress that energy crises treated as a separate issue are very seldom the focus of attention in their own right. As I mentioned here we don’t know when, where, or how big will the nextenergy crisis be, but we should be ready to quickly react and to look for the best solutions for our countries. And the whole region. Actually, the simulation is a perfect instrument for governments and decision-makers to test the situation, to modulate the crisis and finally to find the best solution. Vitalii Martyniuk, expert from Center for Global Studies Strategy XXI, stressed “the necessity to focus on the regional dimension of the simulation within the project and proposed to divide the participants into three groups: governmental representatives, business, non-governmental actors. In this way a region wide (V4+UA) energy crisis communication can be tested”. Dr. Alexander Duleba, Director of the Slovak Foreign Policy Association stressed that “V4 – Ukraine cooperation in the field of energy should go beyond security of supply agenda, and look for gradual creation of regional gas and electricity markets. In institutional terms, it should go beyond governmental structures and involve regulatory authorities, key business actors (national TSOs, national distribution and retailer companies), and last but not least civil society and independent expert communities. It should also include exchange of best practices when it comes to communication and cooperation between government – business – NGO actors on both national and regional level”. Hungarian expert Andras Jenei from Center for Fair Political Analysis added that “the transit agreement between Ukraine and Russia has to be based on a trilateral agreement, with the EU acting as a facilitator. Ukraine needs at least 40 Bcm transit volume to be able to secure the reverse flows from Hungary and Slovakia, as well to maintain the transit system. The ideal scenario is 60 bcm per year”. The participants concurred with the view, that on it’s own solidarity is not enough during an energy crisis, and only written agreements will ensure the fulfillment of the neighboring countries needs during a gas crisis. Dr. Mykhailo Gonchar, President from Center for Global Studies Strategy XXI, stated that “before developing the energy crisis communication models, it is necessary to understand what Gazprom can do according to directives from the Kremlin. It is likely that Russia can engage in active action, based not only on “gas issues”, but also on a wider scale s creating a chaotic situation in and around Ukraine. Therefore, the gas crisis may erupt not only January 1, 2020, after the expiration of the current transit contract, but earlier, during the election campaign in Ukraine at the end of winter and beginning of spring 2019″. Director of the Ukrainian Ministry of Foreign Affairs Department on NATO and EU Serhii Saienko, Head of Energy Security Department of the National Institute for Strategic Studies Oleksandr Sukhodolia and Deputy Director of the Department of Information Security and the Development of Information Society of the National Institute for Strategic Studies Anastasiia Barovska presented the Ukrainian experiences related to the strategic communication in Energy security, including that based on the results of the Table Top Exercises “COHERENT RESILIENCE 2017” on protection of the critical electricity infrastructure in Ukraine. Participants of the discussion noted importance of deignating a key institution, which would be responsible for coordinating communication during an energy crisis communication at the national level, and a key national coordinator tasked with communication at the international level, as well as structuring this communication into a singular and clear mechanism fixed by a legislative act. The meeting was the third in a series of events designed to organize and execute a comprehensive simulation of a hypothetical energy crisis, which will take place during the Warsaw Security Forum in October 2018. If we can be of anyfurther assistance do not hesitate to contact Dr. Natalia Slobodian – the main project researcher +48577899921 (nslobodian@pulaski.pl).